The SC Series bench scale from A&D is constructed with a completely sealed indicator and a washdown base that meets IP68 standards. It provides exceptional performance with a stabilization speed of just 1 second! 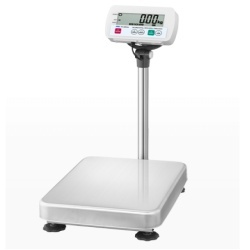 The A&D SC Series bench scale is constructed with a completely sealed indicator and awashdown base that meets IP68 standards. Available from Central Carolina Scale, It provides exceptional performance with a stabilization speed of just 1 second! SCE-02 and SCE-03 cannot be used at the same time. The SC/SE is not IP68 compliant with SCE-02 or SCE-03.